When you come to Miracle Method of Kansas City SE, our knowledgeable professionals in Independence, MO, will explain why surface refinishing is a cost-effective option for replacing your bathtubs, sinks, showers, and countertops. Unlike remodeling, which causes more mess and hassle when replacing your fixtures, our services allow you to enjoy your easy-to-clean surfaces in just two days or less. Get the beautiful tubs, tile, and countertops you’ve always dreamed of at a price you can afford. Stop by our Kansas City SE showroom, which is located at 9920 E. Truman Rd. Call us today at Miracle Method of Kansas City SE to request a free estimate for your surface refinishing project in the Independence area. We specialize in resurfacing bathtubs, tile, and countertops, saving you the cost of demolition and replacement. 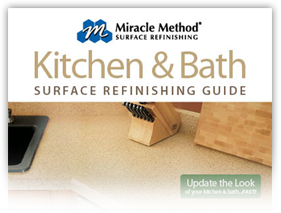 Miracle Method has been refinishing kitchens and bathrooms since 1979. We know what we are doing and can save you a ton in remodeling. Surfaces such as kitchen counters, bathtubs, sinks, vanities, tile, and shower bases can all be refinished to like new! That's right, no need to spend countless dollars replacing!!! We restore surfaces in Kansas City homes, hotels, apartments, and dorm rooms, along with surrounding areas. Skilled technicians with the "Miracle" Method and unequaled service is our success combination. Come see our showroom home office. You will see why we are becoming the best Kansas City resurfacing and reglazing companies for bathtubs, countertops, and sinks. We serve the Kansas City East, North, and Southside, along with all of the KC metro area including Liberty, Independence, Lee's Summit, Blue Springs, Grandview, Parkville, Belton, Raymore, Raytown, Parkville, and Gladstone. We also serve the Missouri side up to 180 miles from Kansas City. Call Miracle Method today at 816-295-6387 to get a quote on the best resurfacing and restoration home services you can get, you will love our product!